AB Gallery Lucerne / Switzerland presents new works by Gabriela von Habsburg and Lulwah Al Homoud. In an exciting encounter the latest stainless steel sculptures by Gabriela von Habsburg and selected paper works by Lulwah Al Hamoud meet in the gallery. The works invite visitors to take a look behind the surface of the concrete and to approach spaces differently. Gabriela von Habsburg is a sculptor. She has faith in the equal partnership between architecture and sculpture. As former student of Professor Robert Jacobson at the Munich Academy of Arts she belongs, similar to her teacher, to the constructivist-geometrical tradition – a movement very beginning of modernism, which practised the reduction of means to geometrical elements and mostly primary colours. Commissions for big sculptures in public spaces distinguish the consistent creation and consistency of the artist Gabriela von Habsburg. Mainly small and medium size sculptures will be presented in the exhibition; their presence and impact in the “small” interior are just as intense as the sculptures in the public space. Lulwah Al Homoud’s style relies on combining and creating a net of forms, lines, Arabic letters, rich colors, and sensory material using bright esthetics. To this end, she uses mixed media and geometric shapes as tools to accentuate her purpose. One can notice in her work an obvious bias to linear and spatial geometry, something that owes itself to the fact that she views it as a fertile source from which to renew her abstract visual vocabulary, and to turn it into a net of complex structures hinting to immortality and providing a feeling of stable equilibrium. 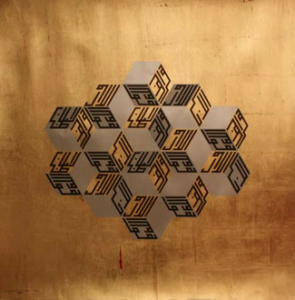 She also uses mathematics, both Islamic and Western, to activate the language of audiovisual communication and to deconstruct Islamic ornament into new, stimulating, and visually exciting patterns. Insofar as Arabic letters are concerned, she takes the liberty of deconstructing them, deriving their symbolic dimensions, and then using these symbols into simple lines that serve as raw material for new designs.